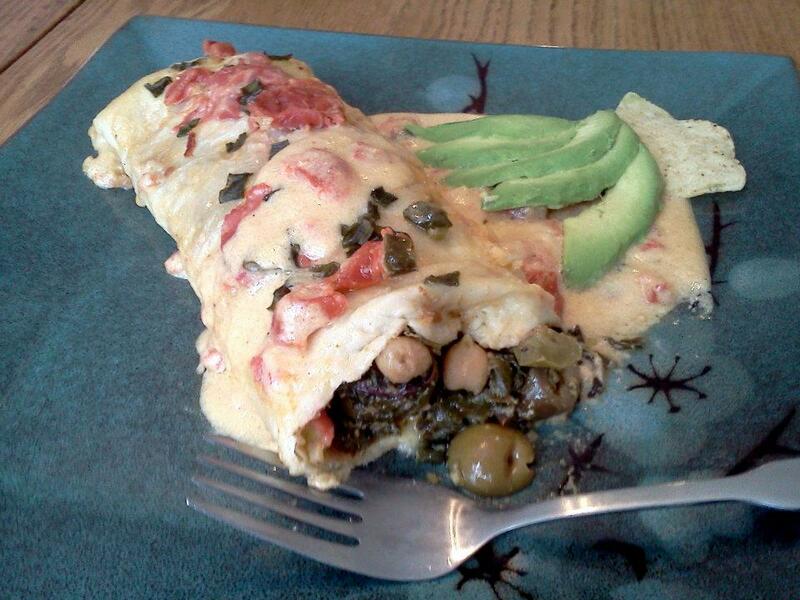 This large enchilada, prepared with a burrito-sized flour tortilla rather than the traditional corn, is a modification of my earlier recipe for Olive and Chard Enchiladas. I added chickpeas (for protein), a bit of feta cheese, and ground whole, dried oregano to the filling and added chopped stewed tomoato to the cheddar cream sauce. Otherwise it’s as described there. This is a really tasty combination of ingredients, and I think it could be done with a tomato-based sauce as well. Thanks to a local pub for the idea to make one ginormous serving-sized enchilada rather than so many smaller ones! A tip: unfortunately with sauces made of cream and cheese, the oil tends to seperate when reheating. I experimented with reheating both slowly in an oven and quickly in the microwave and didn’t see a substantial difference; in both cases the sauce separated. To rememedy this, I suggest microwaving, and then mix in a bit of milk with the sauce afterward, and blend the sauce with a whisk or fork.